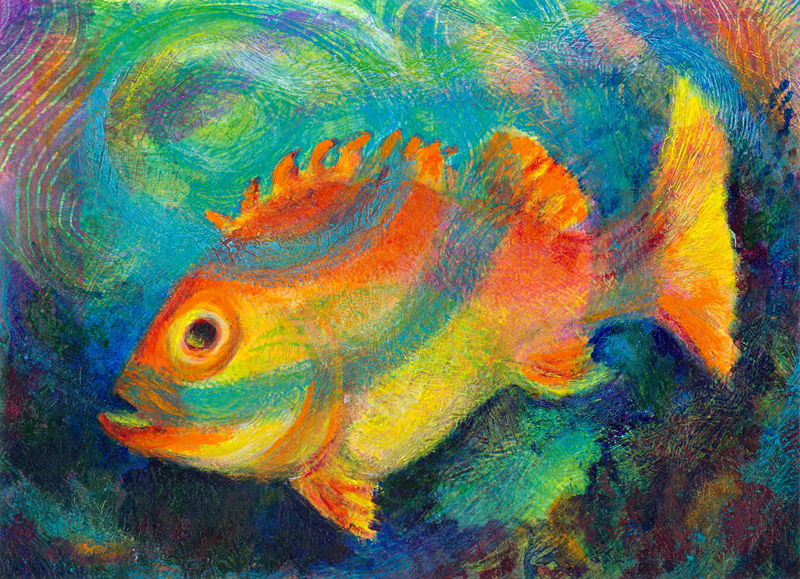 Orange Fish in Emerald Sea is another fish painting of mine. I love painting fish, with their unique shapes, large eyes and gaping mouths. Their eyes and mouths give them unique character.. It’s a gray day here in Atlanta, I’m on my second cup of coffee and am feeling a bit frustrated. I started a new tropical fish painting and it’s not coming together so far. That happens to me a lot, I start the painting and in the middle of the process it is a mess but I know if I stick with it I’ll get it to work. I decided to take a break and upload a painting that I do like here on my blog. I hope you like it too. I just looked outside the sun is out, blue sky. I think the day is going to get better.